On 24 November, 1857, Orlando Lane Castle (1822-1892), professor of Oratory, Rhetoric and Belles-Lettres at the Shurtleff College in Alton (see biography of Orlando Lane Castle), Illinois, received a patent for a calculating machine, called Improved arithmometer for adding (US pat. №18675 from 1857) of very interesting design, operated by a clock spring, wound manually. 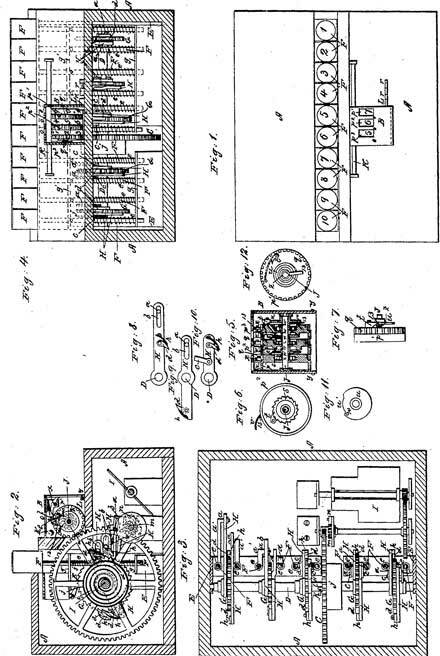 Next year (1858) Castle reissued his patent (USRE 551) and patented another calculating machine, which was essentially an improved version of the first one (US pat. №21941). The calculating machine of Castle seems to be the second in the USA keyboard adder, after the machine of Parmelee (or third, since the machine of his compatriot Thomas Hill was patented in the same day), and fifth in the world, after the machines of White, Torchi and Schwilgué (there is also another earlier patent for a key adder from 1855 (FR24582), granted to the french watchmaker and mechanic Ernest-Narcisse Lobbé, but it remained only on paper). 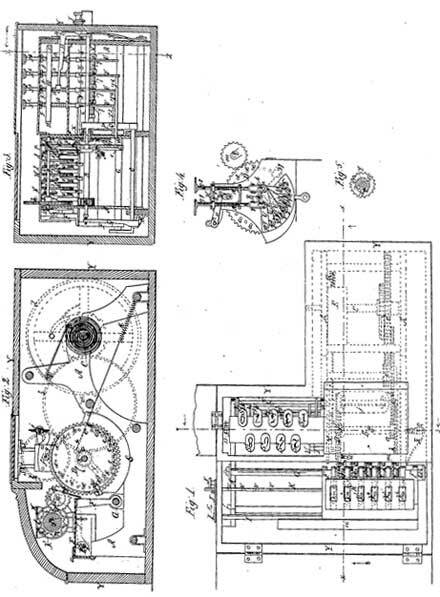 The first calculating machine of Castle was a key-driven adding machine (see the patent drawing below). It was the first machine with a nine-key scheme, connectable to the different orders. 1. Before commencing, the register should be set free of the driving wheel D by turning back the crank J, and the register-wheels turned till every wheel presents its 0 opposite the openings in the plate H, and then the register frame should be brought forward again, with the secondary driving-wheel m, belonging to the first or unit-register wheel k', in gear with the driving wheel D, and should be secured in this position by bringing the crank J into the first notch in the bar K, counting from the right hand on Fig. 3. 2. The unit-column is then added by depressing the keys S', S2, etc., one after the other in the same numerical order as the figures in the column of units to be added, and at every depression of a key the unit register wheel k' is caused to make 1, 2, or more tenths of a revolution—that is to say, as many as the number indicated on the key depressed—and every time the revolution of the unit-registering wheel is completed and the 0 is brought opposite the opening in the plate H the tooth n of the wheel o that is attached to its secondary driving-wheel gives one-tenth of a revolution the the tens-registering wheel k2; and if the sum of the column of units be sufficient to complete a revolution of the tens-wheel, the secondary driving-wheel, gearing with the wheel n that is attached to the tens-wheel receiving motion from the said wheel n, will bring the tooth r on the second wheel o into operation on the hundreds-wheel k3. 3. When the units-column has been added in the above manner, the crank J is raised out of the notch in the bar K of the register, and the register thus thrown out of gear with the driving-wheel F, and, without disturbing the register-wheels, the whole of the register frame is moved far enough to allow the crank J to enter the second notch of the bar K, which brings that secondary driving wheel m which gears with the tens-registering wheel k2 opposite the driving-wheel D, and on the crank J being thrown forward into the notch that secondary driving-wheel is brought into gear with D. The addition of the column of tens can then be proceed with same manner as the column of units. 4. The above mentioned process should be followed for adding of the columns of hundreds, thousands, etc. It is not known if the calculating machines of Castle have been manufactured or influenced somehow the development of other calculating machines.